at the Milwaukee Art Museum. Had an enjoyable time there last Saturday. I love Andy Warhol and this iconic 100 Cans! I had to check if all the cans were beef noodle soup. I would have made one chicken noodle. Later I found out that John looked for the same thing. Also a fan of Roy Lichtenstein. This one is Head--Red and Yellow. I really like the course halftone screens in his work. And Marc Chagall, the Peasant Life. I have a small print of his that I bought years ago in college. Love the color and shapes in this Wassily Kandinsky, Fragment 2 for Composition VII. 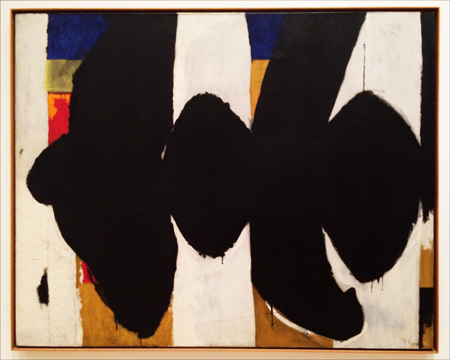 Then there is this Robert Motherwell, Elegy to the Spanish Republic XXXIV. There is a story that goes with this painting. And I will share in my next post. And Frida Kahlo, Self-Portrait with Monkey. Love that monkey and those eyebrows. And, of course Jackson Pollock's Convergence. This painting was huge and mesmerizing. These photos do not do these paintings justice. If you live in the Madison-Milwaukee area I suggest you catch this show before it is gone. It ends September 20th. I don't think you will be disappointed. Easter weekend we went to Chicago to babysit the grand kids and see their parents too. Jackson wants to be a train engineer when he grows up. He LOVES trains. So we took the train from Highland Park to Evanston for brunch. And ended up at the Lucky Platter on Main St.
And the art... total kitsch. I am a total sucker for paint-by-number paintings. If I lived in a loft I would cover a wall from floor to ceiling in them. Also many interesting portraits. Some that looked like things I painted in high school, as a freshman. And hanging art... and oh, the colander chandeliers. So much to look at. And the food is pretty and tasty too. I had the Crab Cake Benedict. Homemade crab cake with garlic aioli, spinach, hollandaise on toasted cornbread. Yum. If you are in the area I recommend it. After referencing a photo of me at the Tate in London at the same exhibit we saw at MASS MoCA I had to dig this shot up. John took it and took only one and was disappointed that it was out of focus. I actually kind of like the blurriness. Interesting that we have a touch of orange in each shot. My shot is probably from about 2007. I can only assume that we will go through life always taking our picture in front of this piece. And I like that. I hope there are many, many more. the extremely talented Nancy Vala (left) makes these amazing avatars. I LOVE mine (on right)! I hate getting my picture taken. I don’t like to put it everywhere I should on the internet. But for some reason I am happy using a sort of cartoon version of myself. If you want one you can visit her site here. Or even better yet go to my Facebook page and share the post and leave a comment to get in on the drawing. Your chances of winning are so much better than buying a lotto ticket. Do it now, you know you want to. To be eligible you must SHARE from my Facebook page, not my blog or my personal Facebook page. After you SHARE plz leave a comment so I have your contact info. Some very lucky winner will get a custom portrait, a $200 value! New font Flourishes & Ornaments is 50% off for a limited time too! i love my avatar! I really, really love it. (I am the blond in the middle... in case you are wondering.) My outrageously talented friend Nancy makes these. (She is the one with the gray hair...) The process was really easy. I sent her 3 pictures and told her what I liked about each. Things like my eyes in one photo and that I wanted yellow hair, bright blue eyes and red lips. It was that easy. On my end anyway. I hate getting my picture taken. I don't like to put it up everywhere I should on the internet. But for some reason I am happy putting up a sort of cartoon version of myself. If you want one you can visit her site here. And watch or like my Facebook page, Nancy is generously donating a portrait for next week's giveaway! Oh, and Nancy has also drawn 3 Outside the Line fonts. I am unfortunately experiencing some web problems. If you place an order and it does not go through plz email rae@outside-the-line.com and I'll send you a PayPal invoice to pay from. My hair stylist fired me. And yes I can hear you all laughing. And those who know me well know that on a rare occasion I have been known to obsess over a couple things. Like, say, the look of a Cobb Salad or the bread in a Reuben Sandwich. To make a very long story as short as possible I need to say when I get less than great hair, especially color I assume some responsibility. It is hard to use words to make someone understand what you mean when talking about color. And I was just plain stupid not to make her get the color swatches out. For $100 I want to look like something was done. I asked for yellow blond and silver blond highlights. I think I got a gold and low lights which are a browny-red. And it is pretty but not what I asked for. As I said long story short she refunded my money and suggested I go somewhere else. She was very nice. I was equally gracious. I have an appointment and will try again. This time I ask for a warm, sunny, yellowy, bright, blond color. Not ashy or dishwater blond. And no low lights ever. If I am lucky I'll look like my avatar. Which I am pretty pleased with. My extremely gifted friend Nancy did it. If you need one like my Facebook page. There is a very good chance that will be my next giveaway. saturday we wandered down to our new library. John had not been there. So we walked through the entire library. In our wanderings we met Angela from the Office of Transcription, Translation & Transmutation. The Office of Transcription, Translation, and Transmutation provides professional assistance for the harried and handwriting impaired. Services include: Live transcription of your immediate thoughts and most heartfelt sentiments into beautiful, curlicue, cursive sentences on real paper. If you are interested in visiting I would call the library and see if The Office is open.